Welcome to another episode of Inspired Growth Portal’s website review. Today we will go over my own website! It has been a month since I started my business – which means that it’s time to change up my “first draft” website. Before I had started, I had identified my primary target audience as first-time or established female bloggers and/or business owners. But all of my clients so far have been small to mid-sized organizations! Instead of forcing the clients to come to me, I will instead shift my focus to the people who need my help – while continuing my passion to guide new bloggers and entrepreneurs on the side. 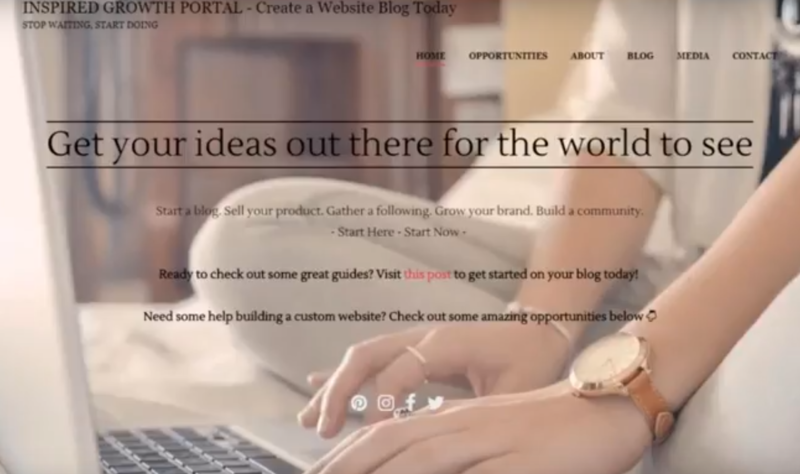 So, the newly focused Inspired Growth Portal is a web-based company that primarily guides individuals on how to plan for, establish, maintain, and/or update their websites. This also includes advertising, marketing, administrative, and social media integration, if desired. In the event that the company or organization does not have a current website manager, Inspired Growth Portal will provide such services until an individual is selected. The primary advertising method for this company is word of mouth and I desire to increase page views and conversions – that metric where readers actually interact with the site. I was also at the stage where I wanted to implement advertising on the page via Google or Amazon, build a landing page, include the revamped brand, and start using Facebook advertising to increase more page views. For this video, I will be using my Website Review Checklist – which you can download for free. 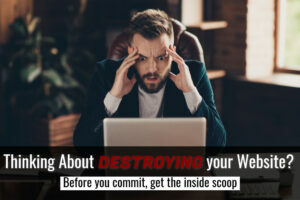 So let’s drink some coffee, sit back, and review the website for Inspired Growth Portal. The first column on the Website Checklist is Metrics, which are a great way to identify how well your site is actually operating. The I had initially selected a single-page style paid theme titled One Tone Pro. It was designed to provide a vast amount of information on a single page, but in retrospect, I realized that the single page was likely the main factor contributing to the 87% bounce rate – which is how often users open a website and then quickly leave it… without interacting with the site. 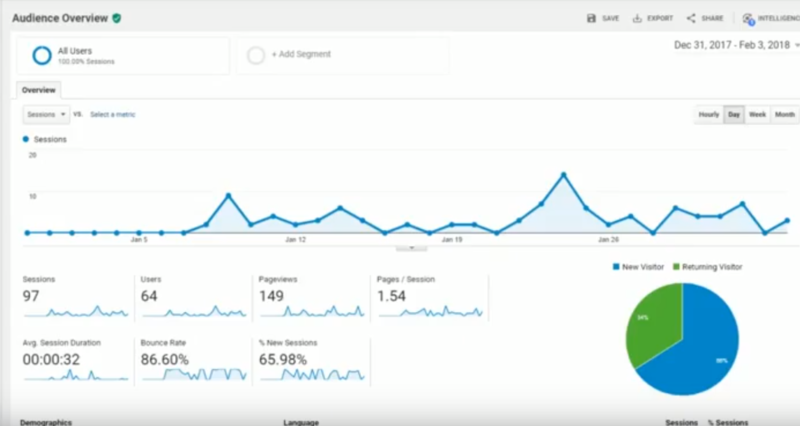 Google Analytics, an excellent WordPress plugin which provides analytical data, showed that as of December of 2017, there have been 149 page views. Unfortunately, the average time on site is only 32 seconds! And of no surprise, the home page was viewed the most. The primary sources for these views was provided by manual advertising on Facebook group boards, Pinterest About Me page, and word of mouth. The next column covers visual appeal. The overall layout of the site is generally pretty, but there had been a significant level of feedback provided that expressed confusion. The title of the website and the menu is located at the top, but the headline text at the top of the page is not very clear about what this website is all about or what services are being provided. Having all the common pages located directly on the home page makes it easy for the reader to review all the information quickly, but at the same time, it doesn’t engage the reader to actually do anything. This lack of a specific cause and the lack of clear direction is likely a factor to the high bounce rate and the lack of conversions. The images selected are free generic photos, except for the owner’s selfie. The font is serif throughout – except for the blog post titles – and it is noticed that some of the text is difficult to read in the sections with background photos. The text sizing is generally fine and the color scheme follows a theme of black, white, light blue, and splashes of red. Overall, the home page doesn’t encourage the reader to scroll down to the bottom as there is minimal incentive to scan the page past the first two panes. Next column up is content. This site is generally informative, but it appears that it is not informative enough and/or not providing the information needed by the reader. Several of the comments received after a small survey stated that the individuals did not know what services or information the site was providing. To dovetail with this, the language is obviously not very effective if the content is unable to convey the information. Spelling and grammar are fine, however it was noted that the content is generally written with a passive voice. 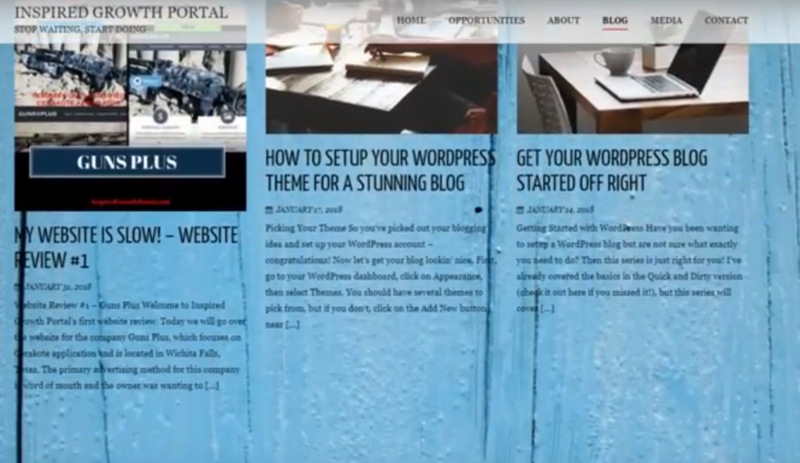 While there is a blog on Inspired Growth Portal, it is not providing enough engagement with the reader, which is based off of the bounce rate, length of time spent on the page, and lack of engagement. Last column up is functionality. The Inspired Growth Portal website is generally intuitive, as the reader can view the information provided and it appears factual. Operationally, the site is great – the reader can view all of the information by just scrolling. Unfortunately, there are two elements that are not fully operational – the older blog section page appears like a last minute addition as it does not match the home page styling, and there is no mention of payment options. Multiple social media platforms are linked to the site and the blog posts all provide options to share to the reader’s desired social media platform. There are multiple links provided in the blogging section, both to internal and external sites. 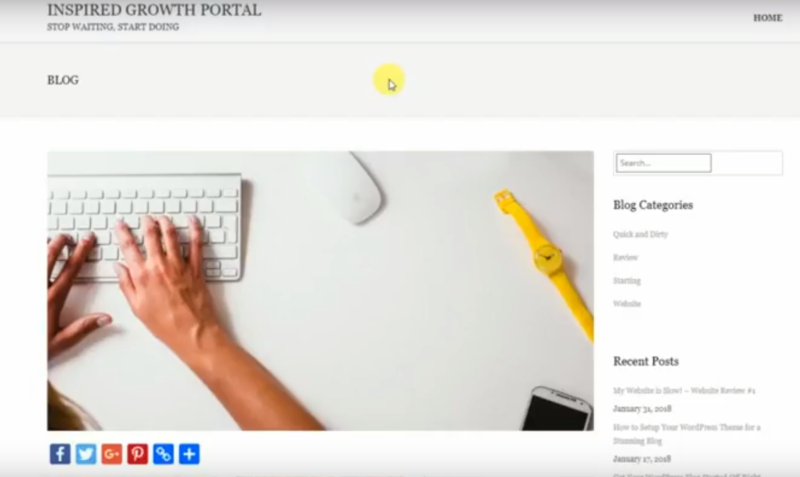 To finish up the review, Inspired Growth Portal is very responsive and appears to have minimal issues switching between a computer, a tablet, and a smartphone, although it was noticed that the pictures on the site appeared to be overly large on a smartphone. After reviewing all of this information and developing this video, I have decided to change up the next iteration of my website. I will switch to a multi-page style, provide additional information is places, while strengthening the overall “identity” of Inspired Growth Portal. I plan to remove the majority of the animation on the website to see if that will speed up the load time. I also want to mix up the images on the pages with a collection of ShutterStock photos, personally taken pictures, and graphics developed personally with Adobe Photoshop. Thankfully, since I’ve reviewed my own site, I don’t have to get permission from the owner. I will implement the steps identified and monitor the metrics to determine if further adjustments will be needed. 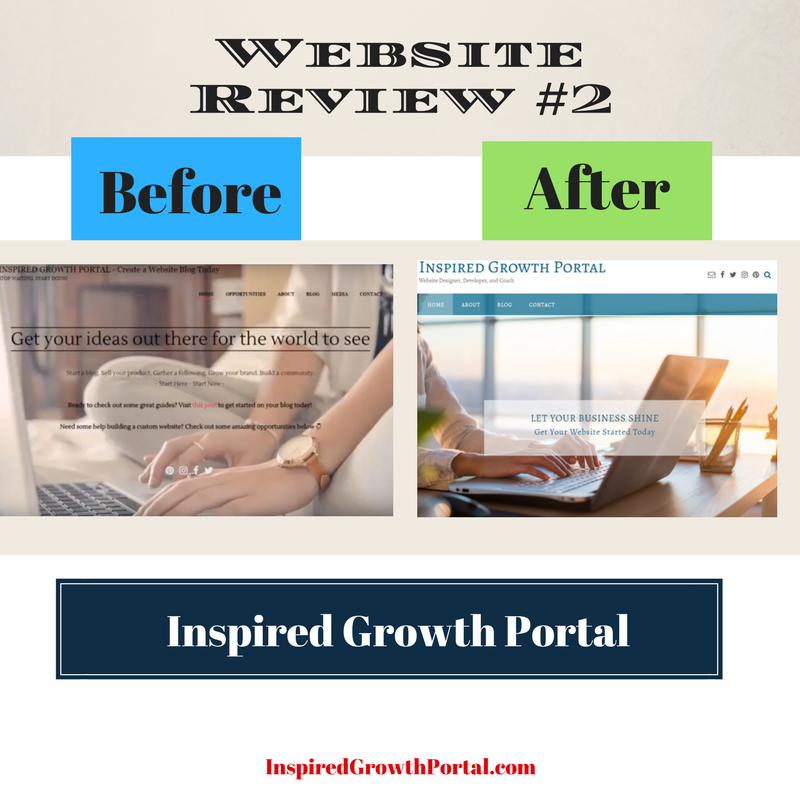 Thank you for reviewing Inspired Growth Portal with me. If you wish to have your site reviewed or need help with updating your website, feel free to contact me.